Size: 54 x 17 x 6.5"
54 x 17 x 6.5" 54 x 28 x 6.5"
Flexibility and extensive control options are key to the production of the Image L40 DMX LED Panel with Yoke Mount from Kino Flo. The 54 x 6.5 x 17" panel employs four menus with several channels that have features that can be controlled on the light via traditional wired DMX or by Lumen Radio wireless DMX. The White menu allows control of 1 to 100% dimming, color control from 2700 to 6500K, and Green/Magenta control. There are two color menus. In the Gels/Hue menu, the Kelvin range is extended to 2500 to 9900K. Among the channels is one called Gel that offers multiple presets for light conditions, such as mercury-vapor, and 100 often-used gel filters. A channel called Hue Angle (Hue) and another called Saturation (Sat) are also included in the Gel menu and function together like a 360-degree color wheel making over two million color combinations available. The second color menu provides RGB (Red, Green, Blue) control, permitting a user-selected combination to obtain any color in the visible spectrum. The RGB menu also allows you to dial in specific gel RGB values or control colors from a DMX console. Finally, there's an FX menu that creates effects such as Candle, Fire, TV, Police, Lightning, Paparazzi, Pulse, and Scroll. Within each effect there are presets that vary the parameters or change the rate of the chosen effect. The Image L40 is ready for worldwide use thanks to its 100 to 240 VAC power supply. 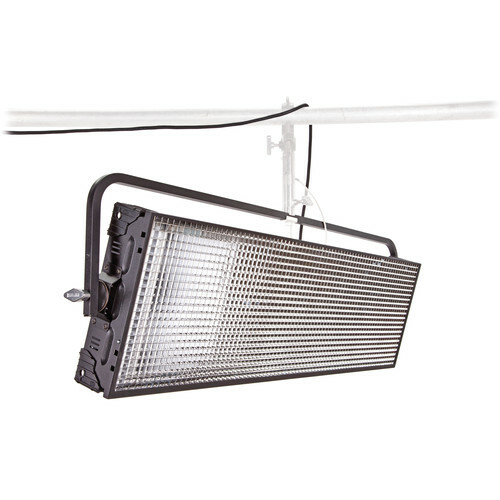 The light comes with a 90-degree honeycomb grid to tighten its beam angle and limit spill light, providing directional control for selective lighting. This version of the light has a Yoke Mount. The yoke has a hole to accept industry-standard hardware such as a pin or receiver. Box Dimensions (LxWxH) 56.5 x 20.5 x 10.5"